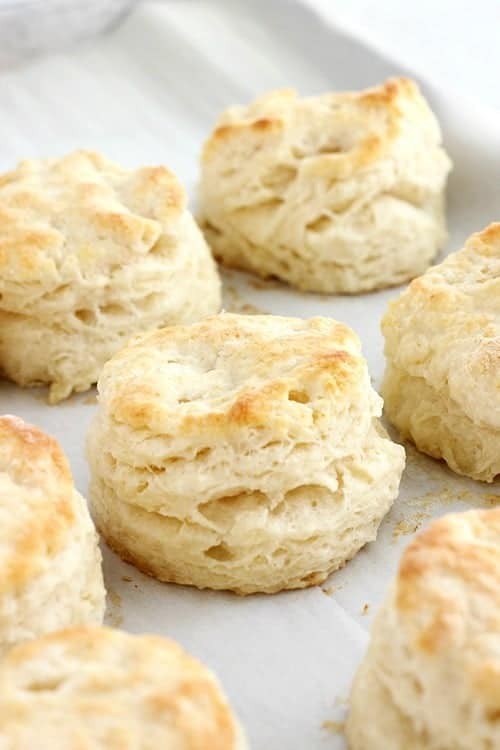 These Easy Homemade Biscuits are filled with layers of buttery goodness. Made with only 5 ingredients; flour, baking powder, salt, butter, and buttermilk! The perfect addition to any meal. Surprise! You have made your way to one of THE fan favorite recipes here on One Sweet Appetite. 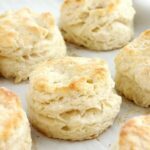 These simple homemade biscuits are as delicious as they come and take just 10 minutes to prep and get into the oven! Quick and tasty are two BIG factors in a winning recipe and this has them both. And the opinion of my picky 9 year old. He goes CRAZY for these biscuits. His favorite ways to serve have to be drizzled with honey, covered in sausage gravy, or as the bun to a tasty breakfast sandwich! The key to keeping these flaky is to handle to dough as little as possible. You do not want the butter to melt at all so be sure you work quickly. There are only a few basic ingredients to mix together but if you feel the dough start to get tacky I recommend some chill time in the refrigerator. Another tip? Pat the dough- DO NOT roll. With cold hands gently pat the dough down before cutting into your favorite shape. Bake and enjoy! One of the best things about this recipe is that it is FREEZER FRIENDLY! Follow the recipe directions all the way to cutting your biscuits. Place on a parchment lined tray. Individually wrap each in plastic wrap and place in a labeled zip top bag. When you are ready to use: Remove from the freezer and bake as directed. Amazing hack, am I right? Fresh, warm, homemade biscuits any time you are craving that flaky goodness. Like this recipe? You will love my 3 Ingredient Sausage Gravy, Olive Oil Drop Biscuits, and Blueberry Biscuits! Combine the flour, baking powder, and salt in a large bowl. Use a pastry blender or two forks to cut in the butter until it resembles coarse crumbs. Fold in the buttermilk until combined. Turn your dough out onto a well floured surface. Use your hands to pat the dough into a 1 inch thick round. Fold on top of itself and press down to 1/2 inch thickness. 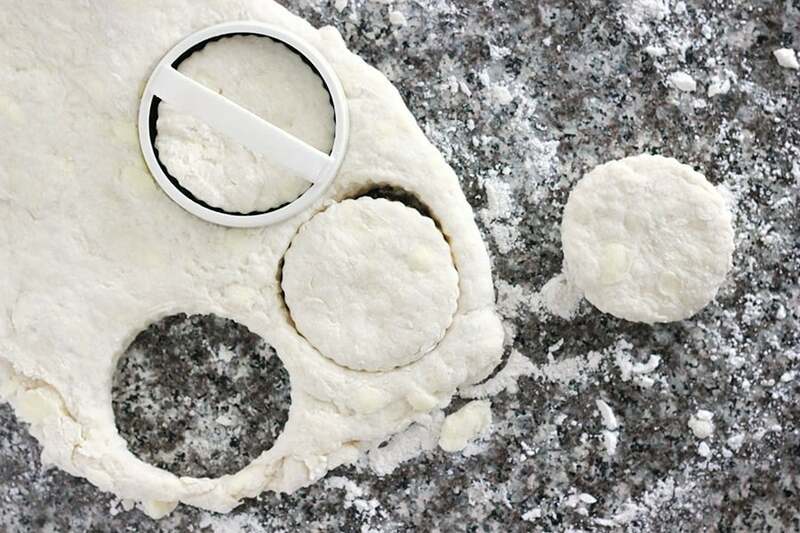 Using a round cookie cutter, or a glass cup, cut out your circles. Place onto a greased pan and bake 10 minutes or until golden brown. Make sure you watch them closely so they don’t over bake. OH YES. Buttermilk would make these bad boys SO delicious. YUM! I’m definitely saving this recipe for later! I miss your face Kaylynn! And your recipe today is so out of the norm and crazy! Love it! Yum! They look delicious 🙂 I just made some biscuits too this weekend (small world right??) I needed something for my apple butter recipe going up this week! You can’t go wrong with biscuits! Great minds think alike! You can never have too many biscuit recipes! Oh my gosh, these biscuits look perfect! I love biscuits and still haven’t tried homemade, can you believe it? I’m afraid they won’t be fluffy, but these look amazing and I am trying these soon! I hadn’t tried them until I decided we needed biscuits and gravy the other day. They are AMAZINGLY easy. And you can’t mess it up. They turn out fluffy every time. Ditto, I love a good biscuit! I haven’t made them in a while, my favorite, shockingly, is a cheddar biscuit! You say, “blender”…you mean food processor! I have an industrial blender; it did not work! I’m sorry you had a rough time. I adjusted the recipe to include a food processor option. I made these tonight. I don’t know what I did wrong, but they turned out horrible. It was my first ever attempt to make biscuits and no success. We made these today for brunch and didn’t have a problem. The dough was a little wet, but I assumed it was the way it was supposed to be. Did you change the recipe Cheri? You mentioned that if you have a small family you might not want to make “so many” biscuits. I was wondering, how many biscuits does this recipe make? We got 12 biscuits from the recipe. I’ve never cooked with buttermilk, and have no idea where I’d find it. Could I use something else instead? Like 2% or cream? Will it come out the same? You can use regular milk if you aren’t sure where to find the buttermilk. Or you can add a bit of vinegar to your glass of milk and let it sit for a few minutes before adding. You should be able to find buttermilk in the dairy section of your grocery store. Love all of the suggestions! a theme as solid as this one. Thanks so much. I have made biscuits before and today mine turned out awful! I’m looking for a new recipe. Do you use self – rising flour? I made my own buttermilk, which may have been my problem. I don’t know where I went wrong and I was so disappointed! I will be trying this recipe next! I made these yesterday and they were SO easy with great results! I will definitely make these again – thank you for this recipe! The batter for mine came out so sticky! I followed the recipe and used them in the food processor, but I think I would rather have done this by hand. I’m not sure what happened but I had to add lots of flour to get them to not be sticky, I’d say about another 1/2 a cup at least. I wish these would have worked! I just got an email with a similar problem. I’ll make the recipe one more time and see if I maybe wrote something wrong in the directions or ingredients. hm… I’m not sure about the Yakult substitute. i have a new biscuit recipe that doesn’t require a blender going up next week. check back! I made these as drop biscuits for quick biscuits and gravy. They were golden brown on the bottom and lightly brown on top, tender on the inside. My guy said they were perfect. Thank you for sharing your recipe. Oh, I used powdered buttermilk. I whisked 4 tablespoons with the dry ingredients, cut the butter into it until it was slightly crumbly, then added the required amount of water. I stirred it until it made a sticky dough then dropped it by big spoonfuls onto a parchment paper lined baking sheet. I had an abundance of nectarines so I made cobbler. Just added 2tbsp of sugar and I just dolloped the mixture and dabs of butter sprinkled with coarse sugar. Baked at 450 for 45min. OMG!!! Best cobbler. I ever made. Thanks. The biscuits are great too. 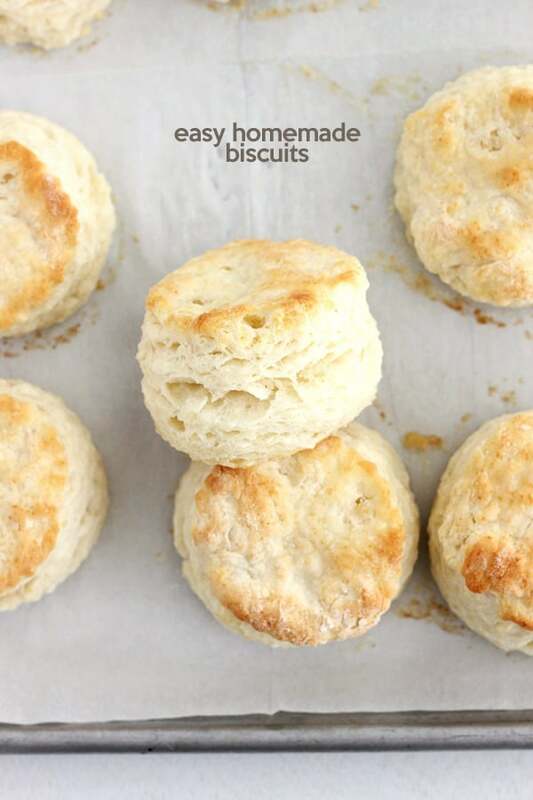 These are the easiest biscuits ever. So much better than store bought. I make them all the time. Thanks for the recipe. 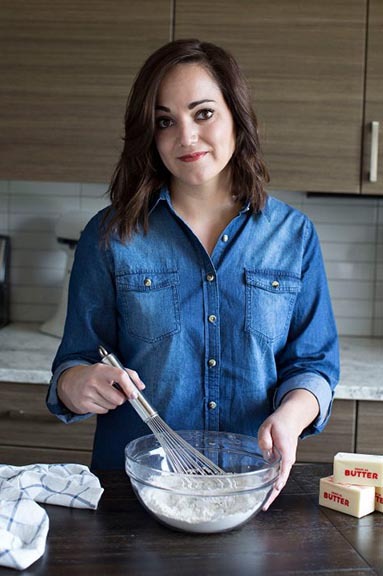 Hi Shannon, I’m glad you love the recipe as much as I do! It has to be one of my favorites. We especially love to use it with my easy sausage gravy! Wow! I just made the biscuits and my batch yielded 10. Listen everyone, they are so good. We ate them with butter and honey. Hi Pat! I am so glad you loved this recipe as much as we do! Thanks for taking the time to rate the recipe! I’m wondering how many biscuits this recipe makes? I’ve got a lot of boys to feed! Depending on the size of your cutter you could get up to 12. I would double the recipe if you are feeding an extra hungry group.